we witnessed many pleasant surprises. We saw all our 3 promising new members performed their speeches. Nicholas Chu made his enthusiastic Icebreaker (standing ovation, please...). tell anybody (... and I suppose I missed the point). recounted his escapades: getting scolded while doing a "full monty"
All of them gave strong and encouraging performances. to-and-fro hassle of ordering and retrieving the plaques! Our next meeting date will be on 1st of August. Be there~! Toastmasters Leadership Institute 7 July. Just before the 070707 Joint Installation Dinner, 5 Extol officers (VPM Daniel, Treasure Chak Ngoon, Secretary Ngan Eng, and VPPR Marvin) had a fine time rubbing shoulders with other club officers at the semi-annual TLI event. This time, the event is held at SEGi College in Subang Jaya. 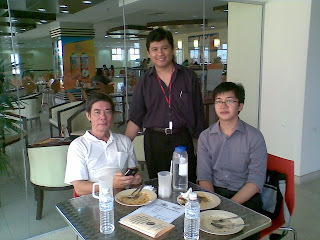 Just before the main event, these hungry Extol Toastmasters were caught hanging around the cafeteria posing for photos.